Since founded in 1969 by Manfred Eicher, ECM Records (Edition of Contemporary Music) have released more than 1200 albums in a catalogue that boasts some of the most important artists of the last fifty years. Eicher’s talent for spotting the right artists to record for his label, and the quality of the finished product in terms of recording, production and artwork have transcended the labels initial reputation of having the ‘ECM sound’ to being acknowledged as producing music of exceptional quality in terms of both performance and recorded sound. The diversity of the music released by the label has grown as the years have gone by, with the New Series releases being introduced in 1984 embracing works beyond the scope of jazz (however large an umbrella that may be), but the label has never forgotten its past. Eicher’s commitment to the artists that record for the label is total with many musicians remaining with the label for considerable amount of time, and thus being given the security that ECM will allow them time to develop their music over time. Saxophonist Jan Garbarek and bassist Arild Andersen have been mainstays since the labels inception and have recorded much of their best work for the imprint, and closer to home (although he too has made his home in Norway), Brit John Surman has benefitted immensely from his long association with Manfred Eicher. Rare in these modern times of quick turnover, ECM has endeavoured to keep most of its catalogue in print, and available on the current medium of the day. To this end the majority of the label's recordings have been available on CD, and are now being made readily available as downloads. Hard to believe that this is the first time that this wonderful album from Gary Burton has been made available on the silver disc, and will be a most welcome release for the vast number of listeners that prefer the more contemporary mediums of CD and downloads. The music on this disc is all the more remarkable for the way in which has been recorded so cleanly with Seven Songs setting a new standard for the way orchestral jazz was recorded. 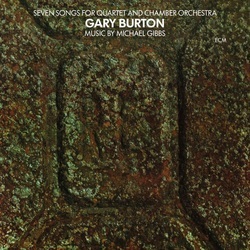 Burton’s quartet with Steve Swallow and Mick Goodrick had already made its presence felt at the time of the sessions, having made an album for ECM The New Quartet earlier that year, but it is still a considerable achievement in the way that the group work together and react with the orchestra. Revered for his big band jazz arranging and composing, we are once again reminded of Mike Gibbs stature as he arranged and conducted all the music for the album and composed all but one of the ‘songs’. The album opens gently with ‘Nocturne Vulgaire’ which segues into ‘Arise Her Eyes’ by bassist Steve Swallow, a tune that has been a staple in Burton’s book for many years. The vibraharpist shows his familiarity and understanding of the composition with some of his most beautiful playing of the set with his ideas as crystal clear as the sound of his instrument. His wonderfully pastoral solo matched by the playing of the strings. Mike Gibb’s makes full use of the orchestra with his dramatic use of the contrast between strings and flutes on ‘By Way of Preface’ that features a fine solo from Goodrick. Throughout Gibbs’ writing for the orchestra never hinder the quartet’s natural rhythmic impulses, and allows plenty of space for the soloists. A prime example of this occurs on ‘Throb’ with the dissonant opening bars that move on to settle into a more even and rhythmic mode for Burton energising solo. Mention must also be made of the superb interaction between the quartet and orchestra on ‘Three’ a truly masterful piece of writing, that brings this vibrant and important collaboration to a fitting finale. This is the third album that Jarret recorded with strings for ECM between 1973 and 1975, a fourth The Celestial Hawk, would be recorded some five years later with a full symphony orchestra. If these releases were met with some suspicion at the time, and they still seem somewhat at odds in Jarrett’s discography that is dominated by his work with the Standards Trio and his solo piano album, then the intervening years have perhaps shown that the initial critical reaction may have been a little misplaced. Recorded at a time when any ‘jazz with strings’ was still viewed with a certain disdain amongst the purists perhaps when put in a historical context in the pianists career it is clearer to see how Arbour Zena sits Jarrett’s development. Just thirty years old in 1975, Jarrett had already recorded a substantial body of work as a leader. His American quartet with Dewey Redman, Charlie Haden and Paul Motian was a working band and recording for Impulse, and the European quartet with Jan Garbarek, Palle Danielsson and Jan Christensen had recorded the Belonging album for ECM the previous year; and in January 1975 Jarrett recorded The Koln Concert. If this left the jazz world l reeling from the shock of what has subsequently been hailed as one of his most influential recordings then it is hardly surprising that his composing and orchestrating for strings would be somewhat overshadowed and cast aside. It is therefore interesting to review this album after the passing of time, and it can be seen that with hindsight, how it sits in the discography in the context of Jarrett’s subsequent development. The previous album with strings, Luminessence, featured Jarrett’s piano and the saxophones of Jan Garbarek, and to this the pianist has added the double bass of Charlie Haden. This is an inspired move, as Haden is magnificent throughout, and his entry on the opening ‘Runes’ alone justifies his presence. Of the saxophonist, Garbarek’s tenor on the album’s longest track ‘Mirrors’ is majestic, and his soprano dances lithely on the trio section within ‘Solara March’ with Haden and Jarrett at their most swinging, and thus forcing the strings to emulate the rhythmic momentum upon their re-entry. Throughout, Jarrett’s writing for the strings is not over laden and provides plenty of light and shade, with an economy in the arrangement that can be unusual when jazz musicians find themselves writing for such a large ensemble. Of his own playing, Jarrett is completely at the service of the music. There is no hint of virtuosic displays at the keyboard and he plays only what is necessary to realise the composition work as whole. Arbour Zena therefore shows a side to Jarrett’s work that is extremely lyrical, and can be seen in many ways to reflect the work that he was doing with his Belonging band. Interesting to note also that it after this album was recorded that Haden and Garbarek formed their trio with guitarist Egberto Gismonti with playing that was hinted at in the aforementioned composition ‘Solara March’. Although recorded in 1977 this solo piano album was not released until 1982, and is a most welcome reissue on LP and making its debut on silver disc. 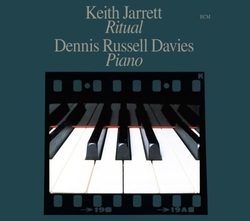 It must be said that this is not a jazz album but a formally composed classical piece written by Keith Jarrett, and performed at Jarrett’s request by conductor-pianist Dennis Russell Davies. The two had worked together in 1974 in a programme of new music performed by The Ensemble at New York’s Lincoln Center. This initial meeting led to further collaborations, and this association has continued to the present day. The music performed is perhaps intended to show another side to the Jarrett’s musical persona, and was written at a time of intense activity and development for the pianist. 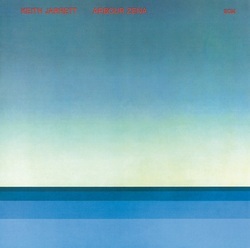 At the time that this work would have been written and composed Jarrett was active with both his European and American Quartets, performing solo concerts, and had also performed other formally composed works including the recording of Arbour Zena with Charlie Haden, Jan Garbarek and members of the Radio Symphony Orchestra, Stuttgart which has also been released on CD as part of ECMs The story of our listening series (see our March CD Reviews). If the touch at the piano is unfamiliar or different then there is no mistaking the composer, as the music has Jarrett written all over it. Listening to the way in which the composition develops it is impossible not to hear echoes of the pianist’s solo concerts, and it seems immediately apparent the written score played by Davies is the work of an improvising composer as opposed to a composer who also improvises. Whilst the CD has two track selections, ‘Ritual 1’ and ‘Ritual 2’ the pieces run seamlessly into each other suggesting that the piece should be viewed and heard as a single entity. Throughout the combined playing time of the music Jarrett has allowed the music to flow with a natural ebb of peaks and troughs, building and releasing tension as he would in his improvised solo recitals. The music is full of rhythmic cues and melodies that appear, evolve and move on. The overall effect is of music that is well thought out and prepared but not over written, a besetting sin of many improvisers who try their hand at long form composition. As such this reissue is a must for Jarrett fans, but is also a work that is truly engaging and deserving wider recognition. Five Years Later is a most welcome follow up to the duos Sargasso Sea set released in 1976. 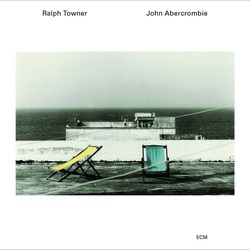 Continuing where they left off, the music made by the Towner and Abercrombie is of intricate detail based on mutual trust and understanding of each other’s playing. The smallest of gestures and nuance are acknowledged and developed to create music that is full of subtleties and melodic delights. Opening with ‘Late Night Passenger’ the duo weave a reflective introduction that leads into a pulsating rhythmic groove set up by Towner as a support for Abercrombie’s electric guitar solo, whilst Towner takes the lead for the acoustic ‘The Juggler’s Etude’. The pair maximise the potential of the collaboration by clever use of the different guitars, both electric and acoustic, at their disposal switching effortlessly between the gentle interlude that is ‘Caminata’ to the rhythmically propulsive ‘Bumabia’. A true collective collaboration with both participants being subservient to both the music and each other, this is music that speaks on an emotional level. If it is high octane pyrotechnics that you are seeking, you will not find it here, nor will you find late night mood music. What you will discover in this engaging set is highly developed and intelligent music making that will warrant and command your full attention. Released for the first time on CD this is a welcome reissue that captures the American reedsman and British bassist Dave Holland together on record. After their collaboration on Holland’s ECM classic Conference of the Birds from 1972 the two musicians found much common ground and worked together consistently in the seven years that separates the two albums. 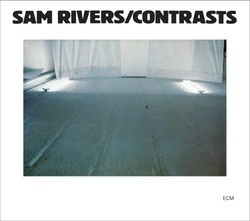 On this outing, recorded under Sam River’s leadership for ECM, the album’s title, Contrasts, can be taken literally, as the music seesaws between structured thematically based tunes and freely constructed pieces, although the sleeve notes advise that all the music was composed by Rivers. The opening cut ‘Circles’ set the mood and tone of the freer or more loosely structured pieces, with the interplay between soprano saxophone and trombone quietly focussed, with an underlying lyricism that keeps the music moving in an agreeably conversational manner. ‘Solace’ is in similar vein with the three way dialogue between soprano, Thurman Barker’s marimba and Lewis’ gruff trombone interjections before Barker’s move to the kit. To this end Barker’s contribution is paramount, whether colouring the ensemble with marimba or propelling the music along from behind the drums his awareness of his surroundings and the needs of his colleagues is much in evidence. His work with River’s tenor saxophone on the fast paced ‘Zip’ is wholly appropriate, nudging and cajoling the saxophonist in to a powerhouse solo. ‘Verve’ find River’s switching to flute for the albums most melodic outing, and this finds Barker throwing in lightly dancing drum figures that follow the flute as opposed to pushing proceeding along. Holland remains steadfast in his role, and if the main interest in the music is the relationship between horn and percussion then it is the bassist who is the cement that holds the construction together, although he does get in a particular muscular and dynamic solo on ‘Verve’. All in all a valuable addition to the catalogue that shows how the free and thematically structured music can work hand in hand. 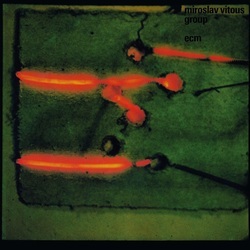 The Miroslav Vitous Group were active from 1979 to 1982 and actually recorded three albums for ECM of which this is the middle one. Recorded in 1980 the passing of time has done nothing to dull the impact of the music, and indeed this is a much welcome addition to the label’s back catalogue. Viewed from a distance, this very much now looks like a bit of a supergroup with all four musicians recognised as major players on their respective instruments. Kenny Kirkland was just 24 when this session was recorded but already shows a total command of both instrument and idiom, even if much of what was played may initially appear to outside of his usual setting. The music is a mixture of more straight ahead, driving jazz as displayed in the opening ‘When Face Gets Pale’ with Vitous stating the theme before the rhythm section kicks in for Surman’s dramatic entry on baritone, and an early version of John’s relentless ‘Number Six, and more exploratory pieces that serve to show the versatility of this superb group. The freer side of the band is displayed in two improvisations ‘Second Meeting’ and ‘Interplay’ that show a remarkable degree of empathy that make the most of the tonal variety available with the bowed and plucked strings of the double bass and Surman’s command of the bass clarinet. Kenny Kirkland’s ‘Inner Peace’ is a wonderful example of freedom within structure, with Kirkland’s tentative opening being joined by Surman’s baritone and Miroslav’s arco bass. This format is repeated on the Vitous original ‘Sleeping Beauty’ that evolves from Kenny’s unaccompanied introduction to some lyrical and jaunty soprano playing from the saxophonist. The whole set benefits immensely from the presence of drummer, Jon Christensen who from his position at the kit will either set up a pulsating groove for the soloists, as for baritone and piano on ‘Gears’ thst puts the quartet through its paces, or by interrupting or displacing the rhythmic impetus and pointing up new areas for exploration. As one would expect, Miroslav Vitous is superb throughout, and on the (all to brief) concluding piece, ‘Eagle’, his arco playing incredibly moving. 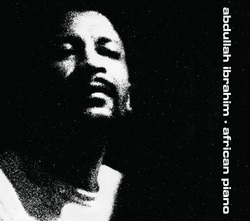 Mastered from the original analog tapes, this captures the pianist in an informal recording made in a rather noisy Jazzhus Montmartre, but listeners should not be detracted from the less than perfect (although much better than most) live sound quality, as Ibrahim’s performance is worthy of serious consideration. From the outset in this continuous set, the selected titles all segue into each other, Ibrahim (or Dollar Brand as he was still known as in 1969) powers his way through some original compositions. If references to idols such as Monk and especially Duke are on display, the pianist still imbues the music with his own unique musical personality, and the music of his homeland. Familiar themes such as ‘Bra Joe from Kilimanjaro’ are investigated from every rhythmical angle, twisting and turning through the themes and the pianist’s improvisations in a headlong rush of notes. It is not until the sixth title, ‘Kippy’ that the pace relents into a reflective and calming moment, only to be off again with the advent of ‘Jubulani – Easter Joy’ seeming to chase the melody around with lithe short bursts and rhythmic stabs that exude the spirit of the moment. This is joyous music making that is full of melodic and rhythmic delights, from an artist that is revelling in the act of playing and communicating so directly with the audience. This is a truly uplifting album that cannot fail to leave the listener with a smile on their face.